Personalized playback: You can customise your playback quality and paused quality. This allows you to experience really fast playback in the editor and trimmer, preventing lagging and making it much easier to time up edits/cuts. Not only can you playback at a different quality, you can now control that quality from the menu in the viewer. This allows you to make faster, snappier edits. 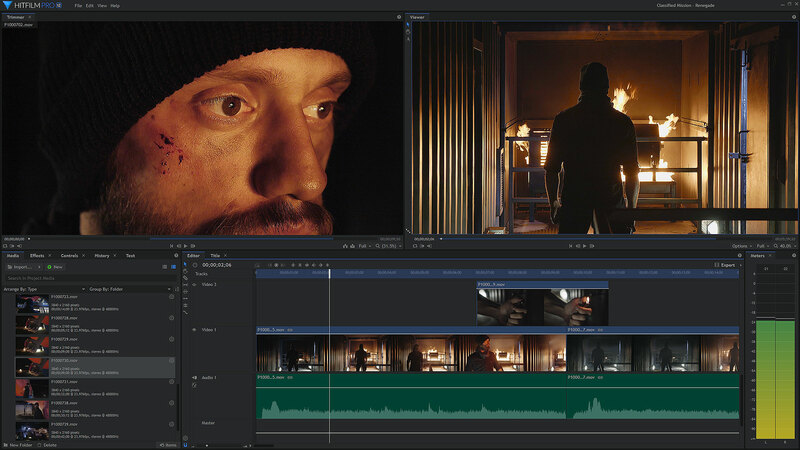 Professional formats: HitFilm Pro’s 8K support and RAM preview ensures the best possible quality for your projects. Work with all footage, from your vertical smartphone shots to high-end professional camera documentaries, HitFilm can handle it. Audio Hard Limiter: Professional audio editing functionality allows you to normalise your audio without any need for external software. Make all the adjustments you need inside HitFilm to create a pitch perfect performance. Particle systems: An emitter can contain multiple particle systems. A particle system is the visible part of the particle effect. The properties of a particle system will determine the visual appearance and behaviour of each individual particle at its birth. Once a particle is born, its behaviour can be affected by multiple external factors such as deflectors and forces. Deflectors & Forces: If you want your particles to interact in more interesting ways, deflectors and forces are what you need. Deflectors are collision areas for particles and can be shapes generated inside the particle simulator or other layers on your timeline. This is a great way to simulate particles colliding with real world objects in your live action footage. 360°video: Take advantage of the updated 360°video viewer panel allowing you to view 360°video in its original state inside the trimmer alongside the adjusted version so that you can easily add the all new 360°video effects. Scopes: Use layer-specific Vectorscopes, Waveforms and Histograms to take your color correction and grading to another level. Cinematic looks: Prep your film for the big screen with HitFilm Pro’s classic cine style and cine style effects. Choose from effects like Bleach Bypass, Day For Night, Grading Transfer, Three-Strip Color, Two-Strip Color and Film Grain to add a flair of drama and cinematic edge. Hyper-stylized effects: Channel your inner Van Gogh with HitFilm Pro’s hyper-stylized color effects. Create dream-like sequences or somber moods with effects like oil painting, solarize, posterize and cartoon. Footage repair: Sometimes (many times) post production has to step in to save the day. Be the hero with HitFilm Pro’s professional noise removal tools and digital make-up for your actors. Chroma Key: HitFilm Pro made extracting actors from green screen effortless with the powerful broadcast quality chroma key. Use the chroma key to get high-quality removal from blue or green screen, control over edge detail, color correction and advanced spill replacement. Green screen: Clean up your green screen footage with HitFilm Pro’s effortless broadcast-quality chroma key. Use the technology to get high-quality removal from blue or green screen, control over edge detail, color correction and advanced spill replacement. 2D Feature Tracking: HitFilm's 2D tracker is designed for quickly tracking moving features in your videos. Once you’ve tracked the feature you want, the data can be used for a variety of things. If you’ve ever wanted to composite a realistic flying craft into your shot for example, tracking is a key step. HitFilm hosts a powerful set of 3D model compatible tools. Import, adjust, texture, animate, composite and render for outstanding integration into your scenes. Models: A number of 3D model formats are compatible with HitFilm. After they’ve been imported and adjusted to your liking they can them be composited into your scene all within HitFilm. Animations: Animate objects and shoot with virtual cameras and lights, with real-time shadows, reflections and physically-based lighting producing super-realistic results. Experience lightning-fast load times, film box support and added .FBX import. Import animation: HitFilm Pro offers support for a number of 3D formats including OBJ, LWO and 3DS. Alembic ABC and Filmbox FBX can also be imported with geometry animation for individual models and groups within HitFilm Pro. Unified 3D space: You can position a 2D green-screened actor in the cockpit of 3D model helicopter without any layering tricks! 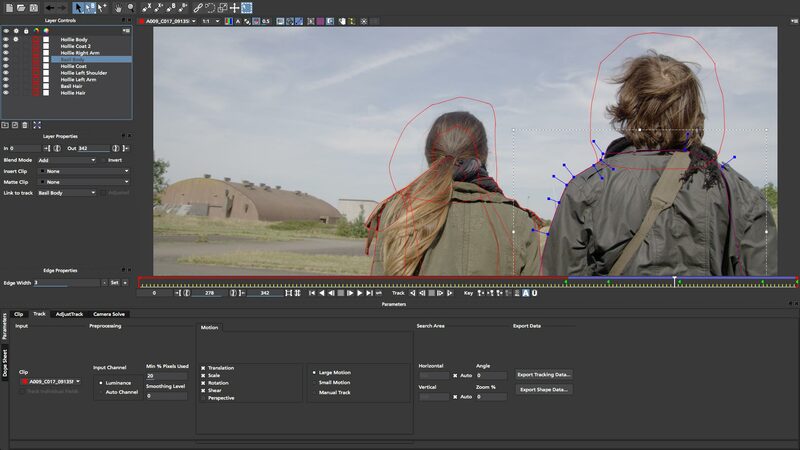 HitFilm Pro’s unified 3D space feature allows you to create layers and models that interact in the same space. Add effects like motion blur and depth of field using the software’s built-in cameras for a more realistic look. Neon path: Create stunning neon sign graphics straight out of a dystopian metropolis or middle-of-nowhere motel. Just add the neon effect to text and shape layers to create life-like neon sign graphics that interact with surrounding elements. Bonus: Neon Path significantly reduces time spent rotoscoping lightswords and laserbeams. After positioning your lightsword using the 4-Point Auto effect, enhance it with flicker, foreground & background distortion for an irregular edge and path animation. Easy sci-fi effects: High-quality visual effects are the building blocks of modern sci-fi classics. So we’ve created a showstopping repository of classic sci-fi tropes - from starfields and lasers, to FTL-jumps, text crawls, earthquakes and even lightswords. Drag, drop and dazzle. Lightning & electricity: Take up the mantle of Nikola Tesla with your very own lightning generator. Use it for Harry Potter wand effects, exploding starship systems or have your actors throw electric bolts with customizable branches, color and motion. Lens flare toolkit: Get the J.J. Abrams look without having to adjust F-stops or shine a maglite into your camera. Volumetric, anamorphic and automatic lens flares are all easy to use with automatic identification and application of flares to bright spots in your layers. HitFilm Pro even simulates imperfect lens flaring from specular highlights, camera dirt and anamorphic streaks. Audio: A range of audio file types can be integrated into your projects in HitFilm including AAC, MP3, M4A, MPA, WAV and WMA. Image & sequences: Importing images and image sequences are a vital part of compositing and filmmaking. HitFilm is compatible BMP, GIF, JPG, PNG, TIFF, TGA, OpenEXR and HDR images for ease of use. Media panel: The HitFilm audio syncing has levelled up. Import video and audio, select multiple clips in the media panel and the software automatically syncs the files. HitFilm Pro comes with a range of free training resources to provide you with the information you need to go from amateur to pro. While you learn our online support systems are ready to provide you with technical guidance. YouTube episodes: HitFilm has a dedicated YouTube channel supplying you with weekly tutorials which show you how to use each of the powerful tools in HitFilm to create awesome effects. Online community forum: If you’re looking for hands-on tips and tricks and can’t wait for another tutorial to come out, our forum are the place to be. With an extremely active and friendly community of HitFilm users you’ll have the answers you need in no time.